Though I consider myself to be quite familiar with Corporate Finance and the vocabulary of Wall Street, I don’t have nearly as much familiarity and experience with trading and sophisticated investing. “Flash Boys” was recommended to me many months ago, and I kept putting off reading the book because I wasn’t confident that I would find the world of high speed trading and issues such as “front running” to be interesting. I have been recently and routinely listening to the Bloomberg “Masters in Business” podcasts hosted by Barry Ritholtz, which has greatly improved my knowledge of trading and investing, and the various strategies and issues commonly associated with this field. This finally inspired me to read “Flash Boys”. Fear not … Michael Lewis has done a masterful job of introducing the modern concepts of electronic trading, high speed trading, the National Market System regulation, Black Pools, etc. In this regard, I will compare him to a financial version of Tom Clancy. Clancy had an amazing ability to introduce military technology, espionage, geopolitics, and strategy to take the reader on a riveting journey through his fictional world. Michael Lewis has managed to achieve nearly the same level of excitement, intrigue, suspense, and engagement in his non-fiction world of Wall Street shenanigans. I believe that Lewis has done a great public service in recognizing and highlighting the heroic deeds of Brad Katsuyama and his team at IEX, the fair, investor-friendly stock market created by Brad. Perhaps more importantly, Lewis has totally exposed the fraudulent, manipulative, and fundamentally unfair trading practices that were, and continue to be, practiced by High Frequency Traders to unfairly front run trades to collect risk free returns. It is true that the HFT guys are not stealing milk money from hungry school kids or retirement savings from grandma and grandpa. However, though the individual impact on each transaction may only be a penny per share, the cumulative impact has been billions of US dollars per year of risk free profit earned at the expense of the investing community with no socially redeeming or morally justifiable basis. 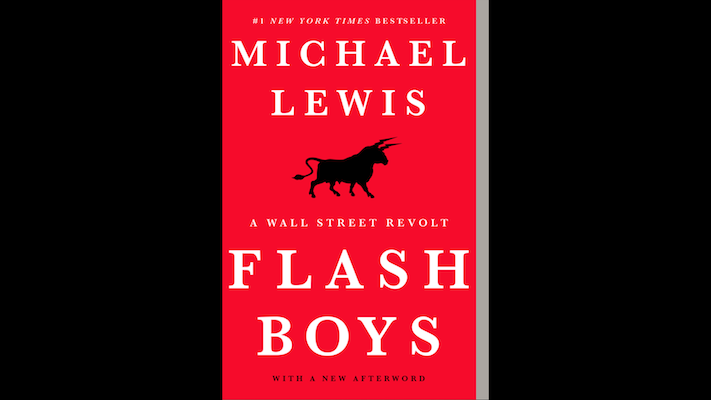 I thoroughly enjoyed and highly recommend “Flash Boys”, by Michael Lewis, and I look forward to reading some of his other books.